Because every generation needs a princess who fights epic battles in skimpy armor? WHAT WE KNOW? Well… we know that Lucy Lawless is not in it. And when the reboot was first announced there was talk of a “modern day Xena”, which briefly made me think it could be a “Xena, takes New York city” scenario. Luckily, they have made it clear that by modern Xena, they simply mean “for the new generation” or something along those lines. 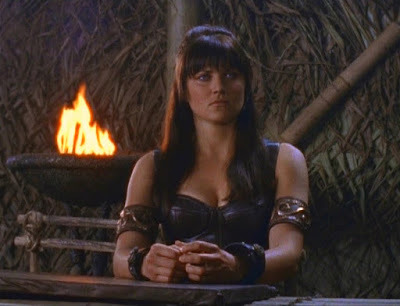 We also know that Xena will have her Chakram [which I like to call deadly Frisbee] and that “soul mate” Gabrielle is still part of the equation. They are also thinking of making her outfit a bit more… realistic because we live in a “post-Brienne of Tarth world”. And we know who is in charge: Javier Grillo-Mauxuach, who wrote a few episodes of Lost back in season one and created The Middleman, a sci-fi show I vaguely remember hearing about at some point in my life [at least I think it is sci-fi]. So… not sure that’s enough to convince me. Finally, they are thinking of making it more serialized [and that I think could work]. WHERE AND WHEN? NBC, 2016[7? ]… maybe. I know Xena is a big part of pop-culture, but I was under the impression that people were more about remembering it fondly, rather than wanting it back. Then I started thinking about the changing TV landscape. Back then, a super-hot amazon running around epic lands was uncommon and interesting. We were ready to ignore the cheesy episode-of-the-week plots and low budget battles. But we are on a post-Game of Thrones era. Everything has changed. Or maybe they ARE trying to ride the GoT wave… and if they are… are they going to try to cast Gwendoline Christie [because that would be kind of cool but also kind of weird]. As you can see… I am slightly confused on what all of this means. Nevertheless, there is something to be said about Xena: it is an important part of TV history. … or maybe it is just a terrible idea. I really don’t know yet. My logic keeps telling me this is not going to work, but I could also envision a situation in which they come up with a decent script and assemble an interesting cast… I guess it could work. So… I am going to wait for now.